Looks good doesn’t it? It’s sort of a hybrid book, in that it’s largely a collection of chapters by a range of authors, edited by Greg Withnail and me (tempted to say Withnail and I, but that would be grammatically incorrect). I’ve got a few chapters in there though, the introduction, which is cannibalising a bit more of my PhD, a chapter I wrote with Anna Peachey on the various reasons why students hate Second Life (again adapted from my PhD) and finally a chapter on the various futures of virtual worlds, including a short description of a potential view of an augmented reality classroom. If you read that description, I’ve deliberately included something that’s almost impossible into the description as a sort of test to see which bit people will pick up on. Although the book is £25, the introduction is downloadable for free. 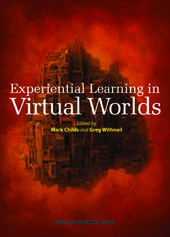 In the introduction, what I’ve tried to do is write it as a proper academic paper, covering a specific subject (in this case how notions of reality influence learning in virtual worlds), but focusing on the chapters in the book as my literature sources. With this the aim was to try and kill two birds with one stone … both introduce the chapters, but also provide something new to the debate. It was prompted by an argument between Greg and me about whether we should permit the authors to use the phrase “real world” to describe the physical world, my position being that this relegates virtual world activity to a secondary status, of not real when it can seem like that for a lot of people, and Greg pointing out that this is just not how people talk; for most people the physical world is the real world. In the end I went along with Greg and we just let the authors do their own thing, but wanted to raise this as an area that is problematic to some extent. Presence and embodiment are key to effective experiential learning, but do not always occur. To be effective for learning, not everything has to be perceived as real, but it is more effective if all participants agree on which parts are real and which are not. (Actually that probably applied to life in general, in the physical world too). Anyway, take a look and see if you feel like shelling out for the whole thing. This entry was tagged augmented reality, book, experiential learning, virtual worlds. Bookmark the permalink. I wonder how much it will cost to have this shipped to the US? Any chance it might be offered on Amazon? Yes it will be, but not for a few months yet. It’s tricky for publishers to sell directly due to needing a US bank account. Inter-Disciplinary Press are setting up an arrangement with an intermediary (Ingram) to sell through Amazon, Barnes and Noble etc. but that won’t be for a few months yet. They do lots of fascinating books, including a follow-up to this one in the works, so it’ll be worth keeping a look-out for their announcement. I’ll mention it here too.